Library - Index - Global Energy Network Institute - GENI is the highest priority objective of the World Game (R. Buckminster Fuller). Removing subsidies on fossil fuels will stop energy price distortions, thereby increasing the market competitiveness of renewables! "Moderating or, when possible, phasing out fossil fuel subsidies, is fundamental to improving market conditions for energy efficiency and renewable energy markets. Tax and subsidy policies should treat fossil fuels and renewable energy equally." Benefits of subsidy elimination would not only ameliorate ecological damage and climate change. "Getting the price right" would promote energy security, stimulate economic growth, boost renewable private investment, and would increase the use of new energy technology. Eliminating artificial subsidies makes electricity production more reasonable and lucrative. A subsidy is government funding given to a private person or entity, intended to benefit the good of society. Subsidies are used to make certain activities cheaper when the activity's benefit is not represented in the financial costs. For example, energy subsidies that make it cheaper to produce or buy energy have been justified to increase access to electricity, providing a higher standard of living to society. Industrialized countries have used this 'public good perspective' to rationalize many forms of subsidies, including tax concessions and direct grants to fossil fuel production. While some fossil fuel subsidies have decreased, they are still estimated to be about $150 billion per year globally, many in industrialized nations. While some people argue that no subsidies are justified, others are promoting temporary subsidies for renewables. The history of subsidizing fossil fuels (thereby altering their price) has made it difficult for renewable energy resources to compete. Governments should temporarily provide funding for new energy technologies so that they can become market competitive with traditional energy resources. Conventional subsidies inhibit research for new technologies by supporting inefficient fuels: Producers receive artificially low prices for fossil fuels, so the return on their investment decreases for R&D in renewables and new infrastructure. Two scenarios can be demonstrated with this graph. First, we can see how, without accounting for negative externalities (i.e. pollution), prices will be artificially low. 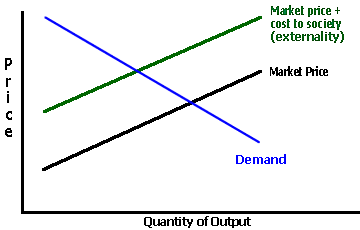 With the same demand curve, the market will set the supply at the market price. As you can see, where the demand curve intersects with the market price, this results in inefficiency- too much output at a reduced price. Governments benefit society when they set policy to include externality costs into the market price. Also, we can demonstrate how a subsidy works. Subsidizing a fuel artificially lowers the price curve to the lower position (market price graph). Since we spend $150 billion on conventional fuel subsidies, and also don't include the externalities in price to the consumer or industry, fossil fuels are cheaper. Minimizing these subsidies and/or creating temporary subsidies for renewables will help make the relative prices for all fuels more realistic. We must be careful when creating any type of subsidy. However, temporary subsidies for renewable energy can be beneficial, if a few criteria are followed. These subsidies can promote the needed competition for clean energy technologies and boost their capacity (leading to natural price reductions). Fossil fuels currently monopolize the market because of government assistance- it is only fair to give all fuels an equal chance to be competitive. Subsidizing renewables helps boost energy access to rural developing communities and lowers prices for renewables in industrialized nations to make them more cost-competitive. These subsidies can be justified because they lead to better health worldwide, to enhanced energy security and to sustainable development goals.